Fapulous - ZineWiki - the history and culture of zines, independent media and the small press. Fapulous was a science fiction fanzine by Elinor Busby. Published during the 1950s in Seattle, Washington, U.S.A, Fapulous was an APAzine distributed through the Fantasy Amateur Press Association, commonly known as FAPA. Each of the issues released in the 1960s was subtitled. The first issue was released August 1959, and was subtitled Faphelion. Issue 2, subtitled Fapoos, appeared in November 1959. Number 3 featured the subtitle: Faprehensive. Issue 4 was released October 1959, as was subtitled Like Hogan's Goat. The subtitle for issue 7 was Fappendage. Later issues appearing in the 1960s were frequently split zines with Busby's APAzine Salud. 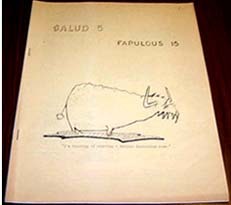 Issue 15 of Fapulous was paired with issue 5 of Salud, published January 1961. Issue 29, which may be the last, appeared in November 1962. It included contributions of art work by Arthur Thomson. Elinor Busby was also co-publisher and co-editor of the Hugo Award winning fanzine Cry of the Nameless. This page was last modified on 14 March 2015, at 10:17.